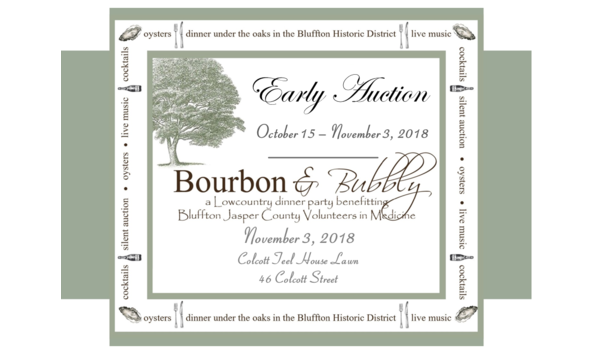 Bluffton Jasper County Volunteers in Medicine (BJVIM) is hosting the 2nd annual Bourbon & Bubbly Gala on November 3rd under the oaks in the Bluffton Historic District. The online silent auction is live now for early bidding and continues during the Bourbon and Bubbly event. Items will be showcased at the event with final bidding concluding at 7pm for all present and online bidders. + SHARE this site or any of the items by clicking on the social media icons.